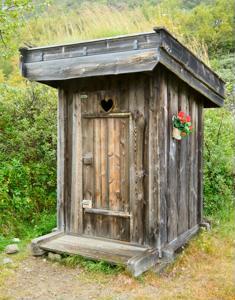 Yes, it doesn't seem like the word perfect and outhouse should ever be included in the same sentence, but hear us out. Many families go on vacations in the summertime that involve the great outdoors, and oftentimes the only bathroom around is a wooden structure placed over a hole in the ground. They're not exactly the most luxurious places imaginable, but it's not hard to make them a little more appealing. If you own a campsite or are planning to spruce up an outhouse in the near future, consider these useful additions. 1. Lime. We're talking about calcium hypochlorite, not the green citrus fruit. You'll need to use this to clean up the "toilet" of the pit. Not only will it get rid of germs, but it cuts down on odors, which really comes in handy. Sprinkle some in once or twice each day when it's in use. 2. Shelves. Although outhouses are usually in the middle of the woods, there are still toiletries and accessories that need storage. A nice shelf or two can hold rolls of toilet paper, air freshener and hand sanitizer. 3. Toilet paper holders. You can never have enough toilet paper, so multiple holders may be of use in the outhouse. Because these amenities are usually outside in the open and made of wood, they might get a bit damp when it rains, so it's necessary to keep the toilet paper off the wooden surface unless you don't mind using soggy paper. 4. A mat. Camping in the woods can get pretty dirty, and it's always nice to be able to wipe your feet every now and then. If you were unlucky enough to encounter rain on your trip, you'll be dealing with a lot of muddy shoes. A mat is especially helpful if you're sleeping in a tent at night and don't want to track in a mess. 5. Entertainment. Just like in bathrooms at home, people often like being entertained when they're using the toilet, even if that toilet is really just a hole in the ground. Place a couple of magazines, comics or newspapers in the outhouse so no one's left to simply stare at the walls. With these five additions, you should have a better experience using the bathroom while you're camping!